B has always wanted to throw a costumed Halloween party so we finally did it this year. I don’t know who had more fun – me planning, buying and creating for the party or the kids at the party. :o) When we got down to the wire, the hubs and I were pretty frantic right before the party started. Thank goodness my BFF showed up to finish the cupcakes for me and one of the moms stayed during the party to take pictures. I ran up for a shower 10 minutes before the party started! We’re having a party! We hope you can come. Get dressed in your costume. We’ll have lots of fun! The party was in between lunch and dinner, so I only provided a few snacks and cupcakes. B wrapped mason jars with white crepe paper and added google eyes for mummy glasses, writing each guest’s name on the back. I cut up carrots, red pepper and broccoli and served it with my go-to dip: bottled ranch dressing, a minced clove or 2 of garlic and dried dill weed. Make it at least a couple of hours before serving to get the flavors to meld. I also made Money Saving Mom’s Pumpkin Chocolate Chip Muffins (a fav in our house) and witch’s brooms made out of pretzel sticks and cheese sticks I cut into fringe. I made Joy the Baker’s Brownie Bottom Ice Cream Cupcakes with cookies n cream ice cream and topped them with a dollop of buttercream icing instead of whipped cream. I needed something more solid to hold the cupcake topper, The Partiologist’s Stained Glass Pumpkins. While I showered, my BFF made the pumpkins. For the goodie bags, I was proactive and went to Walmart last month to take advantage of the back to school sales. I bought each child a box of colored pencils, a box of crayons and split 2 boxes of 20 pencils each among the 8 guests – all that cost $1 per child. I know all the children had just bought supplies for school, but all those supplies were taken to school; these goodie bag items were for use at home. I had originally planned to use a pack of goodie bags I bought at a yard sale for $0.50, but I could not fit the Honeycrisp Apples in them, so I got cute jack-o-lantern bags from Walmart for $0.97 each. B filled the goodie bags and made tags for them with each guest’s name. Now onto the activities. We checked Halloween CDs out of the library and had music playing when the guests arrived. B held a Monster Mash dance party in the front room until everyone had arrived. Then I had all the kids sit down for the mummy game. I bought a bag each of Halloween erasers, vampire teeth, glow-in-the-dark snakes and bugs at the Dollar Tree and wrapped them up inside 3 or 4 rolls of white crepe paper. I worked on that for 2 hours, while watching TV, the night before the party. Sometimes there was only 1 foot of crepe paper between doodads and sometimes there was 5 feet between them. Each child took a turn unrolling the crepe paper until they got a doodad, ripped off the crepe paper they’d unwound and wrapped it around themselves. Then they passed the ball to the next child. You can see B, above, with paper wrapped around his head and in his mouth are a pair of vampire teeth. He had gotten sweaty in his Angry Birds costume while dancing, so I made him take it off to cool down. Each child collected 4 or 5 doodads and then we put them in their goodie bags for safe keeping (that’s why B labeled each bag with a name). By the time the mummy game was over, Miss Lyn and Francesca, our face painter and balloon artists, had arrived and set up. The kids were not interested in face paintings to begin with but they were enamored with the wonderful balloon creations the ladies made! Snakes, horses, light sabers, a green pig to go with B’s Angry Birds costume, an octopus and many more. Anything the kids asked for, they could make. Below you can see B’s face painting – very sinister looking and exactly what B asked her to do – and holding his Angry Bird pig while in costume. Once everyone received a balloon creation, I herded the kids outside to decorate pumpkins while they took turns getting face paintings. I bought 3 packages of 6 jars of paint, some brushes and 2 packages of glitter glue pens at the Dollar Tree and small pumpkins from a local farm. The kids had a great time painting Count Pumpcula, Darth Vader, a Mincecraft Creeper, a fiery graveyard of zombies and more on their gourds. Some of the kids finished their pumpkin painting early and we had a pumpkin roll game. Two opponents had to roll their pumpkin across the yard using a broom. It proved pretty difficult for all the kids except one – he dominated this game. It didn’t matter which pumpkin nor which broom he used, he just flew down the yard! Once the pumpkin and face paintings were all done, I handed out cupcakes and we all went outside to eat them. Then we all went back inside to wash up. B had requested that his guests bring their scooters and helmets to the party, so after washing up, we all went into the alley out back and scooted some of that sugar off. I had let all the parents know that we would be in the alley at the end of the party so they should come around back to pick up their kids. Everyone had a great time and I’m so glad we did this! Last month, I blogged about the Star Wars Jedi Training Academy Birthday Party I threw for my son 3 years ago. 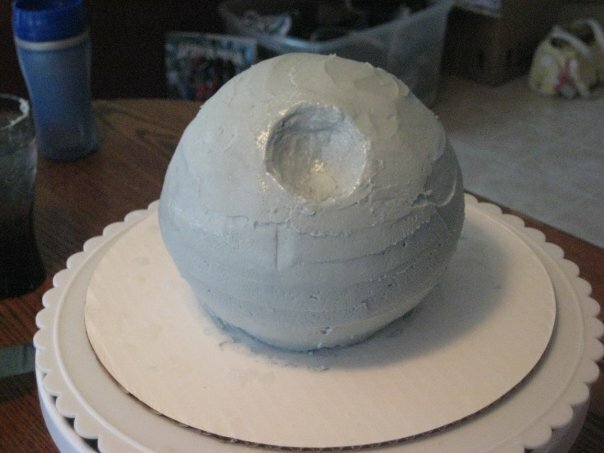 Here is the tutorial on how I made the Death Star Cake. 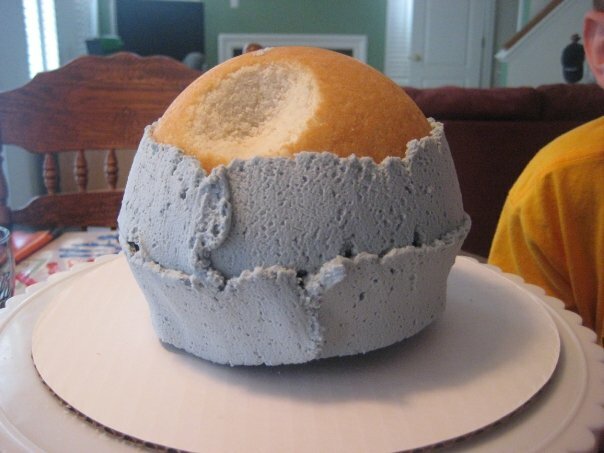 I used the Wilton Ball Cake Pan. 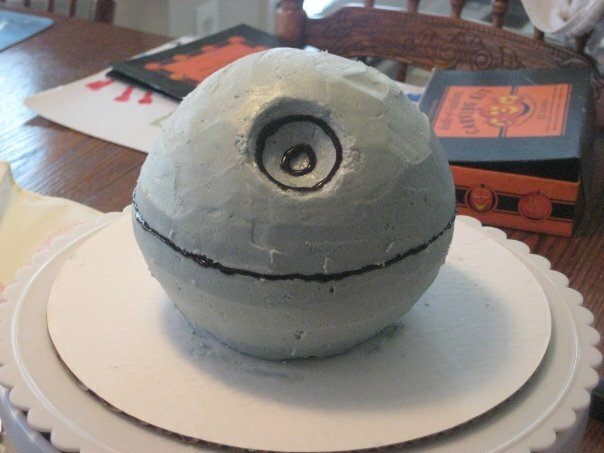 Made half Chocolate Fudge Cake and half White Cake for the Light and Dark Sides of The Force. The chocolate side was heavier than the white side so I put that on the bottom. Shaved a little off so it would not roll. Thin layer of icing so top layer would stick. 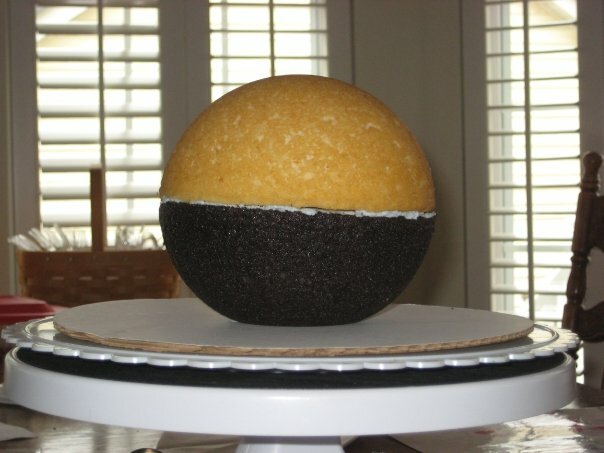 Placed the white cake half on top and the ball is complete. I used the bottom of a paper cut to outline the circle where the laser comes out of the Death Star. This little serated knife from our pumpkin decorating kit cut out the laser hole at an angle. Here is the cone-shaped hole cut out. 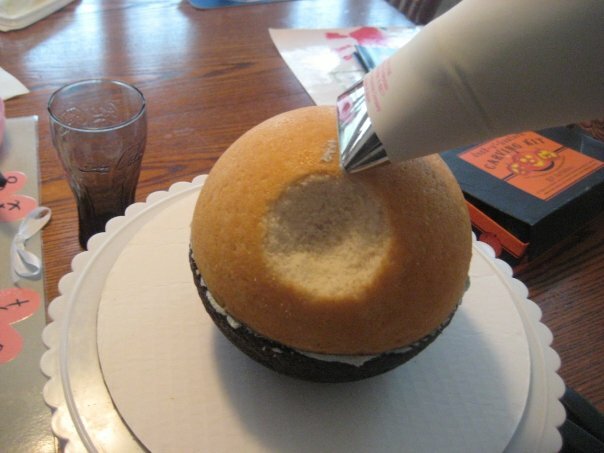 I used my large pastry bag and icing tip to cover the cake. Squeezed the icing on and then used a spatula to smooth it out. Here it is all smooth. I used dental floss to put a line around the middle and then filled that line in with black gel. Used the same gel for circles in the hole. I didn’t like the black circles and suggest making them with gray, instead. 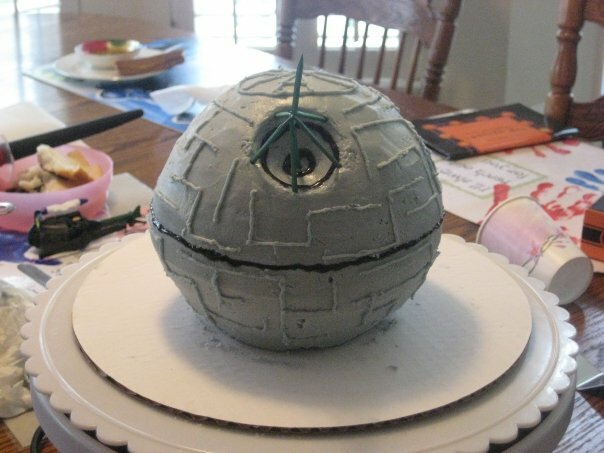 I used gray icing to decorate rest of the Death Star and used green toothpicks to simulate the laser coming out. So B had a LEGO Building Party on the 15th and I had to make LEGO brick cakes! I was going to make 1 rectangular brick from a 9″x13″ cake pan, but B had other plans. He informed me that the rectangular brick was not the “original” LEGO brick; the square one with 4 nodules on top was. He also informed me he wanted a half and half cake, like Wegmans does in their full sheet cakes (one half is vanilla and 1 half is chocolate). I decided to make 1 cake of each flavor. So here’s what I did. With each box of cake mix, I made an 8″x8″ cake and 6 cupcakes. I only needed 4 cupcakes for the top of each cake, but I felt better having extras in case I messed something up. 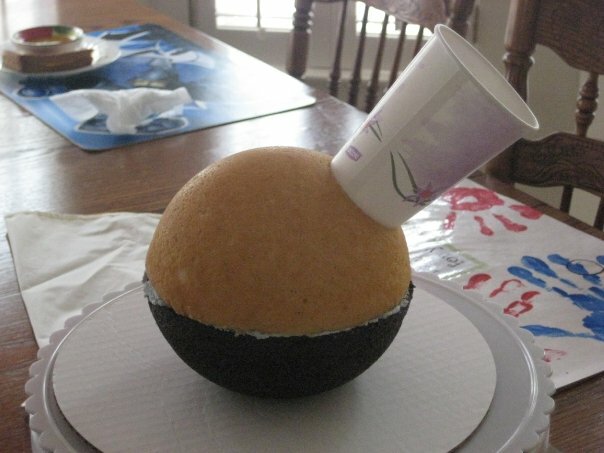 If I am decorating cakes, I never ice them the same day they are baked. I let them set up for at least 24 hours and they are easier to work with, in my opinion. Here are all my pieces, cooled. I sliced off the rounded top of each cake. Turning them upside down would not have worked; I wanted both top and bottom to be flat. 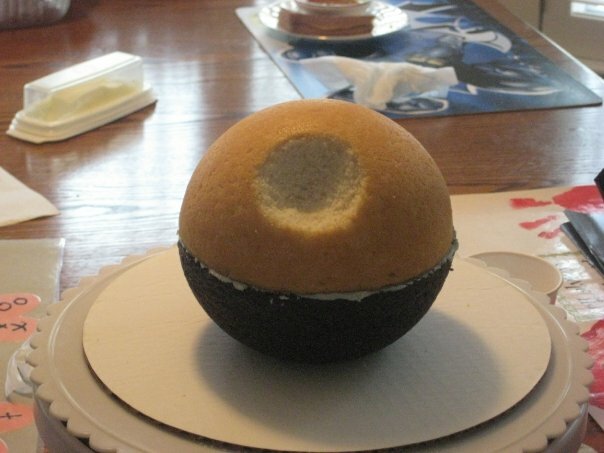 I cut the top of four cupcakes off. Leaving them in the wrapper made a perfect guide line for me. I laid the cupcakes, upside down on the cake to test out where they would go and make sure they fit. 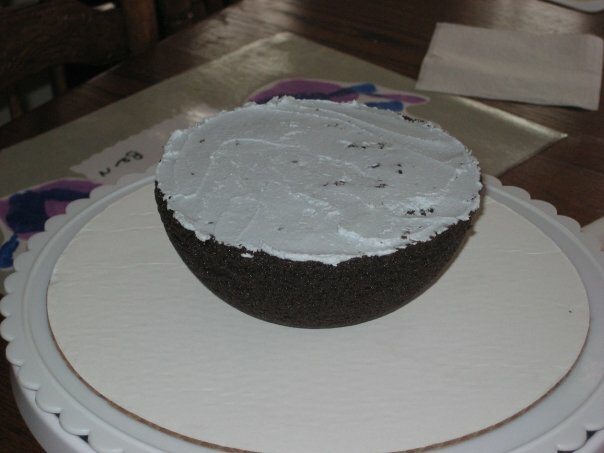 Then I iced the base…. …and each cupcake. I tried holding the cupcakes from the bottom and icing them, but I could not hold them steady enough and I got more icing on my fingers than on the cupcakes. So, I cleaned the bottom of an icing can, put a dollop of icing on it to use as “glue” to hold the cupcake in place and iced them that way. So much better! 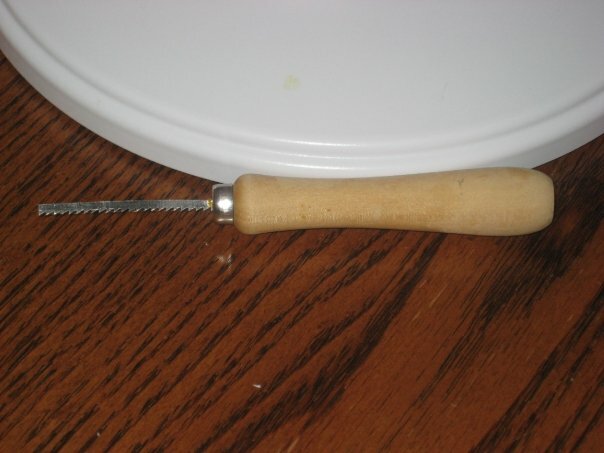 When i had completely iced a cupcake, I used a thin, metal spatula to slide the cupcake off the bottom of the icing can and onto the cake. 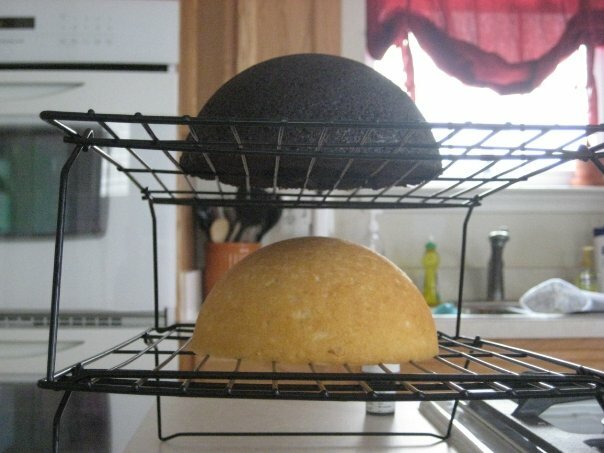 I could have left the cakes like this, but that’ not me. Every nodule (they are actually called “pips”, according to LEGO) on every LEGO brick has the word “LEGO” in it. So I used a toothpick while the icing was still soft and wrote LEGO on top of all 8 pips.